Kuala Lumpur, Paris, 16 May 2017: Malaysian authorities must immediately conduct swift, thorough, and impartial investigations into the disappearances of a social worker and a pastor, FIDH, its member organization Suara Rakyat Malaysia (SUARAM), and the civil society coalition Citizen Action Group on Enforced Disappearance (CAGED) urged today. The three groups made the call a day after FIDH submitted two communications related to the cases to the United Nations Working Group on Enforced or Involuntary Disappearances (WGEID). Between 1980 and 2016, the WGEID received only two other cases of enforced disappearance in Malaysia – neither case is still open. “It is extremely troubling that the spectre of enforced disappearance has reared its ugly head in Malaysia. Malaysian authorities must immediately investigate the disappearance of Amri Che Mat and Raymond Koh in order to determine their whereabouts and safely return them to their families,” said FIDH President Dimitris Christopoulos. FIDH, SUARAM, and CAGED also call on the authorities to take measures to protect those who are involved in the investigations from any act or threat of violence, intimidation, or reprisal. This includes complainants, witnesses, and relatives of the disappeared persons, their lawyers, and NGOs. Christian pastor and social worker Raymond Koh was abducted on the morning of 13 February 2017 in Petaling Jaya, Selangor State, while he was driving his car to meet a friend in a Petaling Jaya suburb. Mr. Koh never arrived at his intended destination. The examination of CCTV footage from various security cameras of houses near the place of his abduction showed a silver car, believed to be driven by Mr. Koh, being surrounded by three black SUVs. The SUVs forced Mr. Koh’s car to stop at about 10:30am. At least eight masked men dressed in black came out of the SUVs before a struggle ensued. Less than one minute later, video footage showed that both Mr. Koh and his car had been removed from the scene and driven away. Two cars and two motorbikes followed the convoy. To date, neither Mr. Koh nor his car has been found. Broken glass and Mr. Koh’s car license plate were later found at the scene. According to an eyewitness account, Amri Che Mat, the founder of a local community NGO called Perlis Hope, was abducted on the night of 24 November 2016 after being stopped by a five-vehicle convoy roughly 550 meters from his house located in Kangar, Perlis State. Mr. Amri was on his way to meet a friend in Jitra, Kedah State. An eyewitness said that roughly 15 to 20 people were involved in the kidnapping. Eyewitnesses wanted to intervene but they made a retreat when they saw that the assailants were carrying firearms and had pointed them at Mr. Amri’s vehicle. Mr. Amri was forced into one of the kidnappers’ cars and the convoy drove off. On 25 November 2016, at 12:30am, a security guard at a school in Padang Besar, Perlis State (about 20km from Mr. Amri’s house), discovered Mr. Amri’s car moments after two vehicles had entered and then only one vehicle had left the school compound. The windscreen and side windows of Mr. Amri’s car had been smashed. Several elements strongly suggest the involvement of individuals with ties to state actors in both abductions. First, the abductions appeared to have been carefully planned and were professionally executed, with both operations taking less than 60 seconds. Second, the abductors appeared to be well funded (they had several vehicles, including SUVs and pickup trucks) and – in the case of Amri Che Mat’s abduction – possessed firearms. Finally, to date, no ransoms have been demanded, nor have the families been contacted directly or indirectly by the abductors – a fact that suggests the abduction was not carried out for monetary gain. Malaysia’s Inspector-General of Police (IGP) Khalid Abu Bakar has made numerous public statements that illustrate animosity towards the parties demanding a thorough investigation and provided no meaningful information on the status of the police investigation. On 6 March 2017, Mr. Khalid told a press conference “to please shut up” and allows the police to investigate Raymond Koh’s abduction. Khalid also dismissed allegations that Government Special Forces were involved in Mr. Koh’s abduction. On 20 March 2017, Khalid said that the police investigations were at a stalemate and blamed the media and the publicity for the lack of progress. “To the media, individuals and NGOs who want to get involved in kidnap cases, shut your bloody mouth,” he warned. On 6 April 2017, Khalid was quoted by numerous news media as saying that instead of focusing on the abductors, police were investigating Mr. Koh’s activities. The police also criticized the dissemination of information about Mr. Amri’s disappearance on social media and claimed that it endangered his safety. “Instead of trying to sweep these two serious crimes under the carpet, the Malaysian authorities must seriously investigate these two disappearances and inform the victims’ relatives about the progress and results of the investigations. The government should also immediately begin the process of ratifying the convention on enforced disappearance,” said SUARAM Executive Director and CAGED member Sevan Doraisamy. Article 2 of the International Convention for the Protection of All Persons from Enforced Disappearance (ICPPED) defines enforced disappearance as “the arrest, detention, abduction or any other form of deprivation of liberty by agents of the State or by persons or groups of persons acting with the authorization, support or acquiescence of the State, followed by a refusal to acknowledge the deprivation of liberty or by concealment of the fate or whereabouts of the disappeared person.” Articles 3 and 12 of the ICPPED impose on state parties an obligation to conduct prompt and impartial investigations into all allegations of enforced disappearances. Malaysia is not a state party to the ICPPED. However, the ICPPED codifies international law applicable to enforced disappearance and is universally applicable. The WGEID is a body that the United Nations established to assist families of disappeared persons in determining their fate or whereabouts. The WGEID receives and reviews cases of enforced disappearance and transmits them to governments concerned to request that an investigation be carried out in order to clarify the fate or whereabouts of the disappeared persons. The International Federation for Human Rights, known by its French acronym FIDH, is an international human rights NGO representing 184 organizations from close to 120 countries. Since 1922, FIDH has been defending all civil, political, economic, social and cultural rights as set out in the Universal Declaration for Human Rights. From our Member, SUARAM, Malaysia – Prosecution of Young Refugee Violates Malaysia’s International Human Rights Obligations! From Our Member SUARAM, Malaysia – Conviction of Lena Hendry Another Blow to Freedom of Expression! 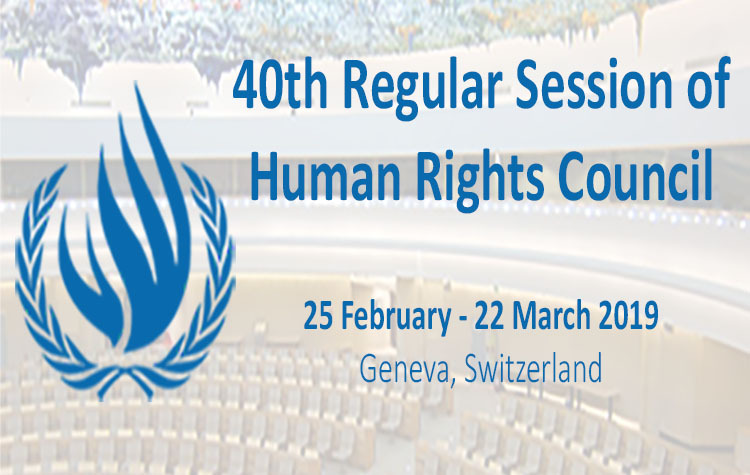 From Our Member SUARAM, Malaysia – 19th HRC Regular Session – Malaysia: Anifah Aman on Malaysian Human Rights: Truth or fiction?